Note: Support Enterprise includes up to five brands. Support Enterprise with the Multibrand add-on includes up to 300 brands. If you support multiple brands, a support email address is created for each brand you add. For example, support@brand.zendesk.com. You can add more support addresses for your brand. For more information about support addresses, see Adding support addresses for users to submit tickets. Note: Your account has a single email template that cannot be modified by brand. If you want your email notifications to customers to vary based on the brand of the ticket, you can create multiple triggers to do this. For information see, Using the email template with multiple brands. Click the Admin icon ( ) in the sidebar, then select Channels > Email. Beside the brand you want to create a support address for, click Add address. Your support addresses are organized according by brand. Enter the Address and Name, then click Save. You can also select a different Brand here, if you need to. 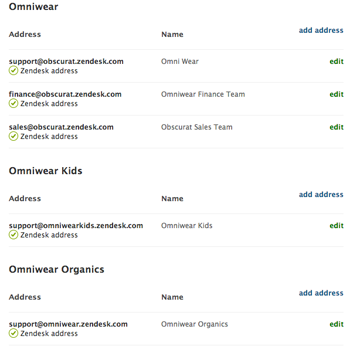 If you create a Zendesk support address for a brand, you cannot change the brand that address is associated with. To change the brand of a Zendesk support address, you'll need to delete the address and recreate it. If you create an external support address, you can change the brand the address is associated with by clicking edit next to the external support address name. For more information, see Adding a Zendesk support address and Adding an external support address. Once again I am shocked, for us brands are independent from each other. We do not want users from brand A logging into brand B etc and we also do not want users from brand A accessing ticket forms from brand B. This is basic business and confidentiality and needs to be addressed urgently. To clarify, i'm referring only to Ticket Forms not other content. Ticket Forms are not true HC content but come from the support site, and they are not brand aware, by which I mean I can prentend Ticket Form 1 is for Brand A, but Zendesk just shows all public ticket forms on all Help Centers. We have gone with a work-around of using one additional "public" i.e. very generic ticket form that is vague enough to collect information for three very different brands / businesses. I agree with Chris that Zendesk needs to address this sooner than later to get the most of out Multi Brands, otherwise it simply does not feel complete. Were in the same boat. Our Ticket forms are based on our different products which we want to split into different brands. We can't have customers for Product A submit tickets for Product B. We need a way to filter which Ticket forms are available/displayed in each Help Center. Until that happens we can't use this feature. Is it possible to have different chat hours fro different brands? At this time, it is only possible to set operating hours for each Zopim department, not per brand. If your brands correspond to departments one for one, then this should work wonderfully. If not, you may need to make some adjustments. Please have a look at Creating a schedule with operating hours for more information. Let me know if you have any other questions! It looks like one of our Customer Advocates made a really great Tip of the Week for how to limit ticket forms by brand! You can head over to the article here. Yes, at a quick glance that looks very promising, and not too cumbersome to implement. Thank for pointing us in the direction of that.